Two initial thoughts: my hair is SO short and also, I was totally pregnant in this pic. Weird. Anyway, the cardigan is matchy-matchy which is normally not my style, but it's nice to mix it up. And when in doubt with shoes, always go neutral. This is a super-casual look, but I actually wore it to work (insert awkward emoji face here). 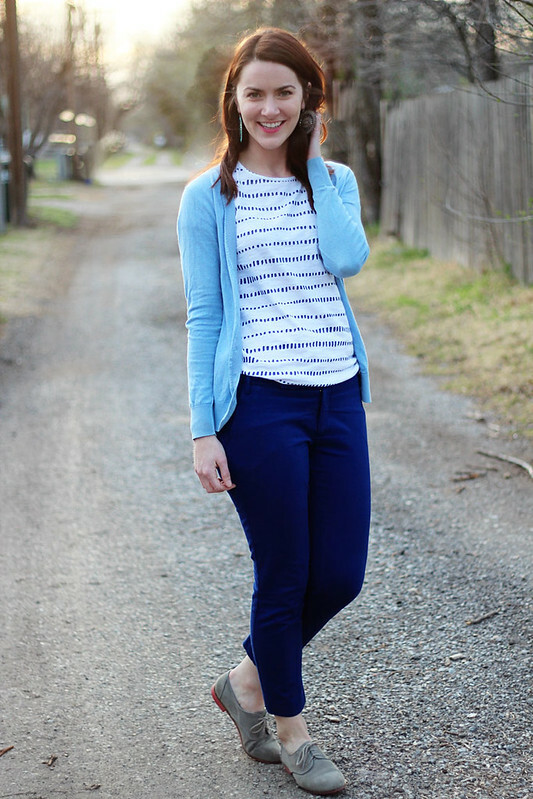 I looooove tone on tone and the cobalt pants are perfect for it. This is one of my favorite looks! The leather jacket with the suede booties add a lot of texture to an otherwise blue-and-black outfit. More blue and black! What doesn't go with black? Am I right... yes or yes? 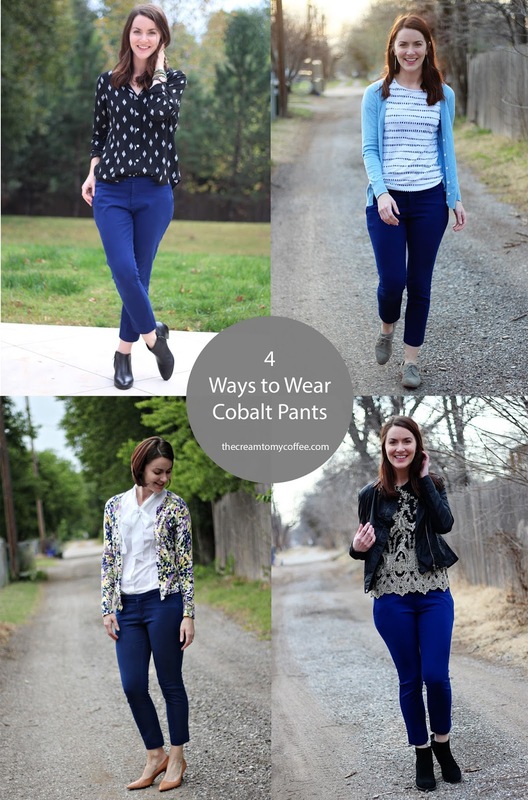 For anyone looking to build their professional wardrobe, cobalt pants are seriously amazing. Can you tell I love these pants? I know, I haven't made it clear enough yet :) I have a few similar pants linked below (each under $50). it is definitely a fear of mine for things to fall apart and me not be able to buy the exact replacement. i feel you. i don't drink starbucks, so i am not worried about them. love these pants, and the leather jacket look is fabulous. What a great pair of pants! I am always nervous about having to replace pieces of clothing (or shoes!!) that I love. I need to find my cobalt jeggings and wear them again. These are great ideas and you look so cute. You've really gotten your money's worth from these! I donated my cobalt pants a while back because they weren't the right shade or fit for me, but I really like yours!